Early reports believed the comet had disintegrated, but the latest analysis suggests that at least a small part of the sun-grazing comet is still intact. 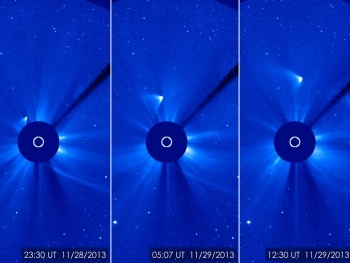 Continuing a pattern of surprising behavior, comet ISON appears to have survived its trip around the sun. NASA and other space agencies have tracked the sungrazer comet, named for an orbit that brought it just 730,000 miles from the sun, since September 2012. After reaching perihelion, the point in the orbit nearest the sun, at 1:37 p.m. ET on Thursday, astronomers watched to see if the comet's nucleus had survived the solar radiation and gravitational stresses. For four hours after perihelion, the comet was not visible to ground-based solar observatories or NASA's space-based Solar Dynamics Observatory. The European Space Agency (ESA) declared the comet dead on Twitter at 4:31 p.m. ET yesterday. A bright streak of material appeared later, and the trail continued to brighten, dissuading notions that it was simply the remnants of ISON's tail.NASA reported in the early hours of November 29 that "late-night analysis from scientists with NASA's Comet ISON Observing Campaign suggest that there is at least a small nucleus intact." The ESA gracefully retracted their Twitter obituary, tweeting, "Well well, seems reports of comet #ison's demise have been greatly exaggerated!" The ESA's PROBA2 Science Center offers some possible reasons for the comet's apparent absence after perihelion. The PROBA2 satellite and extreme-ultraviolet telescope SWAP were pointed toward the comet to capture images of its passage by the sun, but were not able to see the comet. The ESA suggests that the comet may have not had the correct composition or may not have experienced enough heating from the sun's corona to be visible to SWAP. The comet experienced a sudden increase in brightness, known as an "outburst", in mid-November. The outburst made the comet visible to the naked eye under perfect conditions. NASA's Comet ISON Observing Campaign suggested at the time that the increase in brightness may have signaled that the comet was beginning to break up, making its close brush with the sun more likely to cause it to disintegrate. Now that the comet appears to have survived, it is expect to pass within 40 million miles of Earth on December 26. Whether or not the comet will brighten further and become visible during daylight, as originally predicted, remains to be seen.